It is said that no two snowflakes are alike. It’s the kind of fascinating knowledge that makes a person want to catch each flake that falls on a fingertip, looking, before it melts, to see just how different it is from the last. It never gets old, because the outcome is never the same. Rolls-Royce is the automotive version of that, except for the fact that most of us commoners would never be allowed to put our grubby fingers on one. That sad fact of life aside, Rolls is known for a few things: expensive vehicles; overuse of the words “majesty,” “scintillate” and “bespoke” non-sarcastically; umbrellas; events the non-wealthy can only read about online; and, ultimately, its car customizations so detailed that they’re almost unfathomable. The Silver Ghost Collection, which was only made up of 35 cars is full of pure silver accents. The piece of hammered copper right there goes back to the original car’s engine bay. Some of the cars belong to collections, like the Silver Ghost Collection that the company made to “pay homage” to the original Silver Ghost from the early 1900s. Rolls-Royce only made 35 of them, and put a ton of real silver accents inside and out. Others are one-off vehicles, like the blindingly purple “Phantom in Fuxia” named after its buyer, Michael Fux. That purple color is specifically for him and his Phantom, Rolls said—no one else. One of the customizations goes so far as to feature a hood emblem made of real rose gold, and interior features sculpted by artists. Basically, they’re cars, and they’re nicer than probably any hotel or resort most of us have stayed at. It’s a sight to see, really. Gaze upon the fanciest Rolls-Royce customizations of 2018 and weep, for only the ultra wealthy get to check the time on their diamond-encrusted car clocks, which look way fancier than those rhinestone watches on the clearance rack at Target, while being chauffeured to whatever important things they need to do. The rest of us will have to stick to catching and admiring snowflakes, because that’s a type of customization we can all afford. An umbrella from a Silver Ghost Collection car. Umbrellas that come in Rolls-Royce cars cost about as much as a smartphone, each. One of the 925 silver clocks inside of a car from the Silver Ghost Collection. A custom Rolls-Royce Dawn called “Silicon Valley Meets Black Badge,” which went to, of course, a Silicon Valley executive. Google’s Vice President of Engineering, Benjamin Treynor Sloss, ordered this Dawn, which is apparently yellow and blue instead of yellow and black. It matches the rest of his car collection, which is modeled off of the Modenese flag. The blue, not black, on this Dawn is called “Pikes Peak Blue” because of its owner’s interested in the hill climb. The “Scarcer Than Gold” Rolls-Royce Phantom, which is has a metal called ruthenium in it. Ruthenium is, apparently, scarcer than gold, because only 20 tons of it are mined per year, compared to 2,500 tons of gold. The “Whispered Muse” Rolls-Royce Phantom, which is all about displaying art with silky patterns and rose-gold accents. The “Whispered Muse” Rolls-Royce Phantom has a hood emblem made of actual rose gold, which was a first for Rolls-Royce. The “Whispered Muse” Phantom has an art adaptation in it that Rolls-Royce calls a “sculpted silk adaptation of the Spirit of Ecstasy,” its hood emblem. It was done by British artist Helen Amy Murray. The “Phantom in Fuxia,” which went to Michael Fux, a man with double-digit counts of custom Rolls-Royces. This was his 11th one. 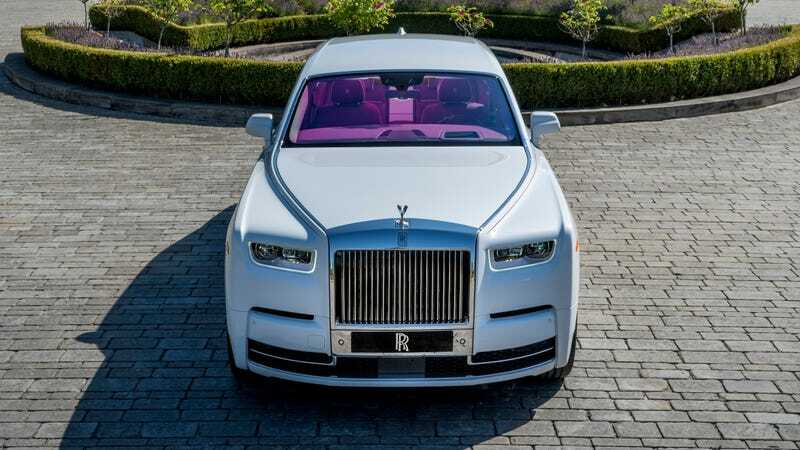 The “Fux Intense Fuxia Pearl” color on the Phantom in Fuxia is Fux’s alone to use on the car, according to Rolls-Royce. A Rolls-Royce Dawn commemorating Czechoslovak squadrons in the Royal Air Force, which has all kinds of hints at the squadrons in the car, from the colors, to the squadrons’ mottos all over the car. It also has headrest embroidery with the badges of the squadrons and an “an interpretation of the Rolls-Royce Merlin engine” that was in the planes. The “Cullinan Viewing Suite,” which pops out these leather seats and cocktail table from the back of the SUV with the press of a button. Drinking can be done on the inside of the Cullinan Viewing Suite, as well. More fancy drinks in the Cullinan Viewing Suite. A car from the Adamas collection, which included 40 Rolls-Royce Wraiths and 30 Dawns. The cars have “unbreakable carbon structures woven into” them, and the Spirit of Ecstasy front emblem is made of carbon fiber. The dashboard clock in these cars is encrusted with laboratory-grown black diamonds, too, just because. The Rolls-Royce Wraith Luminary collection, complete with shooting stars in the headliner. The Luminary collection is limited to 55 cars, and the “stars” inside come from 1,340 fiber-optic lights.